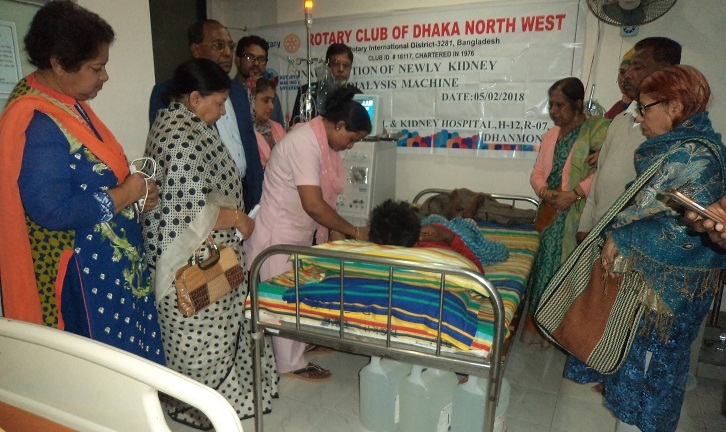 ‘Rotary Club of Dhaka North West’ donated a kidney dialysis machine to Dhanmondi General and Kidney Hospital in the capital for the benefit of the underprivileged patients. The machine was formally handed over to the hospital authority on Monday. From now on, the underprivileged patients suffering kidney ailments can avail treatment with nominal price at the hospital. Managing Director Dr Usuf Hossen Noor received the machine on behalf of the hospital. During the handing over ceremony, Club President Rtn Engr. Md. Abdul Majid, Secretary Nahar Ferdousi Begum, Chairperson and former member of the parliament Kazi Shammi Sher, Engr. AKM Abdur Razzak, Layla Rozi, Hilen Mozid, Shahinur Parvin, Azadul Huq, Monowara Begum and Habiba Khatun were present.